We started off by prepping the ingredients for the mushroom filling. This tasty mushroom filling included the following ingredients. I started by melting the butter in pan over medium heat to keep the temp low. Once the butter was melted I added the olive oil to the melted butter, then the sliced garlic to sauté until fragrant. Once the garlic was fragrant I added the mushrooms until they began to sweat and release their juices. Once the mushrooms were slightly brown I added the salt, onion powder, and garlic powder. Then I added the beef broth and let the mixture reduce until the beef broth was absorbed. Once the broth was reduced I removed the mixture from the heat and let it cool. I then placed that in to a food processor and mixed it with the ricotta and parmesan cheeses. I blended these together, adding more broth if the mixture got too thick. Once mixed I stirred in the remaining ½ cup chopped mixed mushrooms. Now it is time to make the dough for the ravioli pasta. We have done this two times before so we are not experts by any means. Making pasta at home takes both improvisational skills and patience. You have to be willing to start with the recipe and tinker as you go until everything is just right. I will say we got close to perfection but could have rolled the pasta a little thinner than we did. But that is how you learn to cook… it is not the mistakes you make but what lessons you learn from them! Debbie wanted to make the pasta and started by sifting the flour and salt together. From there she placed the flour mixture on our kitchen table, making a well in the center of the flour. From there she dropped the eggs into the flour well, using her hand to break the egg yolks and beat them slightly. She began to combine the eggs and the flour together gradually adding warm water to make a stiff dough. Once she had kneaded the dough until smooth, she covered the dough and let it rest for 15 minutes. After about 15 minutes the dough was ready. We cut the dough in half and using a pasta machine rolled the dough into two very thin sheets. Once the dough was in two thin sheets we laid one sheet on the kitchen table with a generous amount of flour laid out. We began to place dollops of the filling about 1 ½“ apart all along the dough. When the sheet of dough is fully dotted with the filling, cover with the other sheet of dough. With your fingers press the dough between each dab of filling to seal it. Then using your Heart Shaped Ravioli Cutter cut each ravioli and lay on a flour covered surface to dry. Allow the ravioli’s to dry 1 hour before cooking them. Now here is where things got interesting for us in the kitchen. We picked a simple homemade Vodka Sauce recipe to make for the ravioli’s. This recipe (as the name indicates) contained Vodka, which as many of you aspiring chef’s may already know, will catch on fire when heated. Our expectation was that we would light the Vodka with a match to create the flames. Much to our distress (and to our microwave which now sports a melted keypad) the Vodka lit on fire immediately and freaked both of us out. Luckily the only damage was to the microwave as I was able to pull the pan off the stove quickly preventing further damage. I will add learning to cook with alcohol to my “to do” list! We started by heating a sauté pan over medium heat then adding the olive oil. I added the garlic and cooked for 30 seconds until the garlic was fragrant. At this point I added the vodka, nearly burnt our house down, and removed the pan until the vodka burned off and our microwave melted. Now that our neighborhood is safe again our picture taking resumed. We added the cream and let the sauce simmer for 1 minute. From there I stirred in the tomato sauce and added salt to taste. Once the ravioli was dry I dropped them into boiling salted water and cooked them for 15 min. We took the ravioli’s out and drained them. 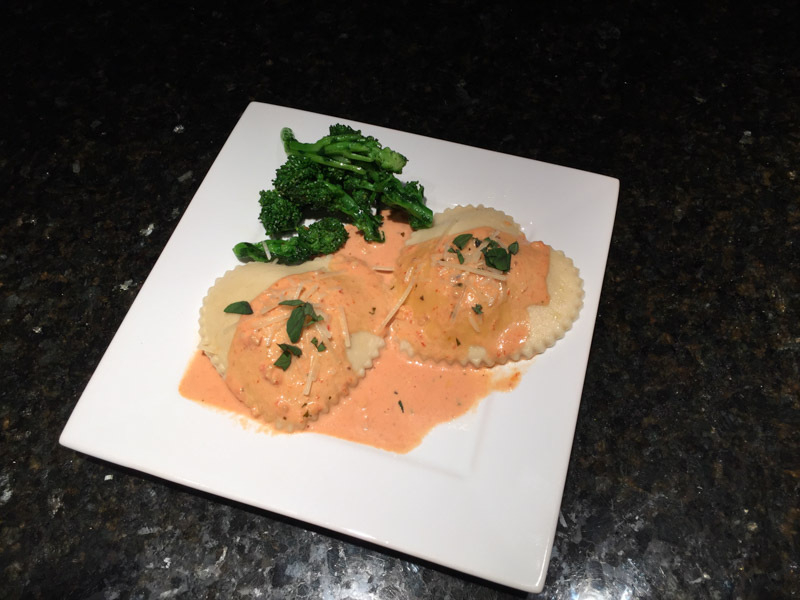 Once drained we tossed the ravioli’s with the Vodka Sauce and garnished with parmesan cheese and fresh basil. This is a great time to open a bottle of your favorite wine and enjoy the meal and this wonderful Valentine’s Day dinner for two! Tonight we enjoyed a bottle of Adelsheim Elizabeth’s Reserve Pinot Noir. Romantic dinner for two featuring Heart Shaped Mushroom Ravioli with Vodka Sauce. Add mushrooms and let them sweat until they release their juices. Add salt, onion powder and garlic powder. Add beef broth and let the mixture reduce. Once reduced, remove from heat and let cool. Blend cheeses in a food processor; add cooled mushroom mixture to cheese and blend together, adding more brother if the mixture is too thick. Stir in remaining ½ cup chopped mixed mushrooms. Sift flour and salt together. Place flour mixture on a board, making a well in the center of the flour. Drop about 1 – 1 ½ tsp of filling about 1 ½“ apart all along the dough. When the sheet of dough if fully dotted with dabs of filling, cover filling with other sheet of dough. Press dough between each dab of filling to seal it then cut ravioli with a pastry cutter or share knife. Over medium heat, heat olive oil in large sauté pan. Carefully add the vodka, light the vodka then shake the pan until the vodka burns off and the fire goes out by itself. Add the cream and simmer for 1 minute. Stir in the tomato sauce and salt to taste. Once the sauce is heated through, toss with strained ravioli. Garnish with parmesan cheese and basil. Man, I just saw a pasta press on sale the other day and didn’t buy it -_-. Any recipe that starts with 1/4 of butter is cool with me and I love mushrooms. Looks great!